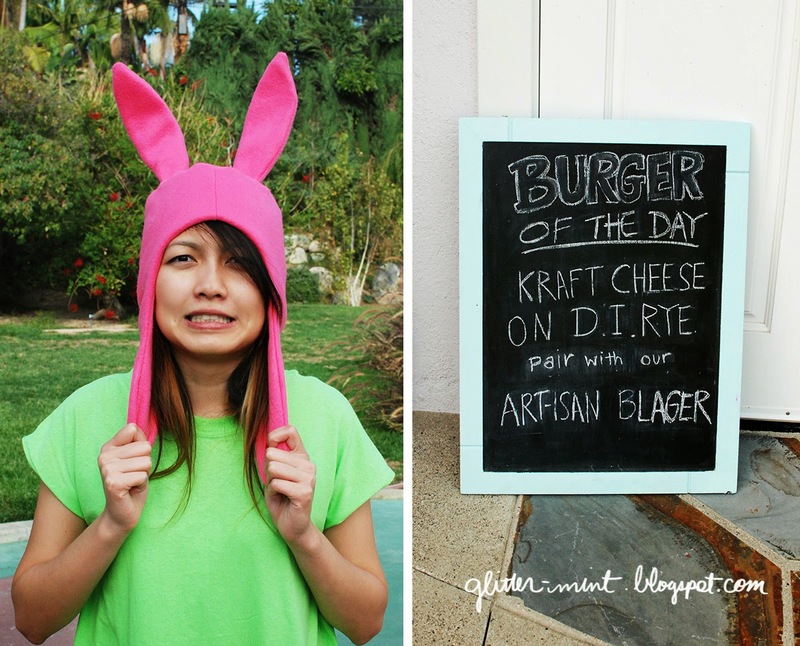 Halloween is coming up and we decided to whip up another fun animated show inspired costume! 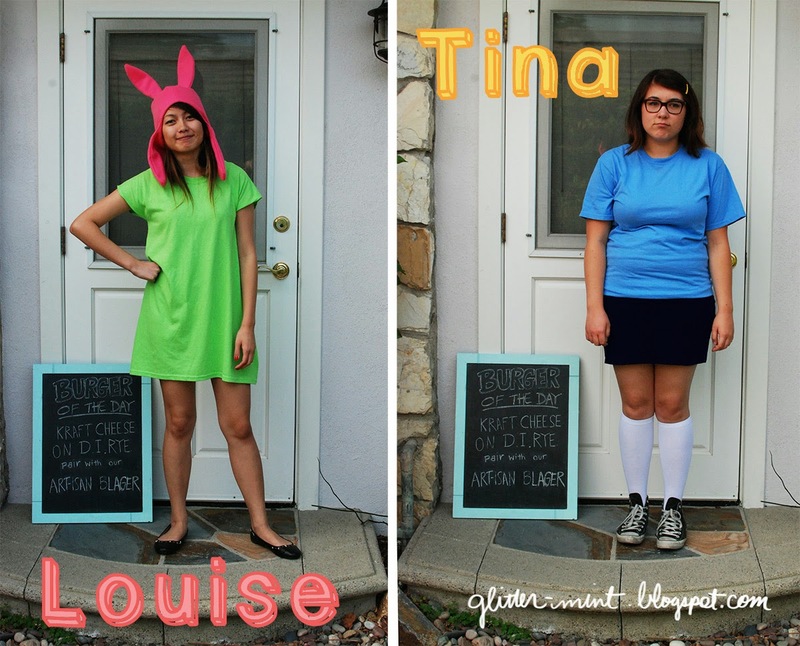 This time, it's all about the Belcher sisters, Tina and Louise! If you have never seen an episode of Bob's Burgers you are missing out on some good stuff. It's a show about a family that owns a burger restaurant. Every character on this show has their own thing... The oldest sister Tina is going through her awkward preteen years dealing with confused emotions about butts and zombies and Louise is kind of an evil mastermind with a dose of sarcasm. They also have a brother named Gene who is weird but lovable and uses the keyboard to write his rhymes and record weird sounds. Don't get me started on the parents... just watch the show, its fun and everyone who works on it is really talented and I love it. Now check out how we put these looks together. 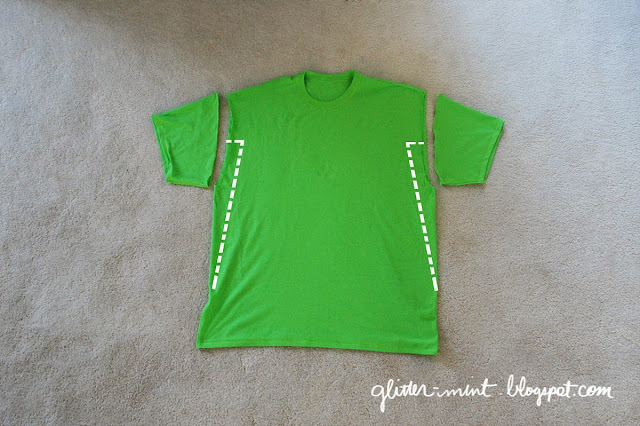 We took an over-sized t-shirt and made a more fitted dress out of it by pinning and sewing on the marked lines with my measurements. 1. 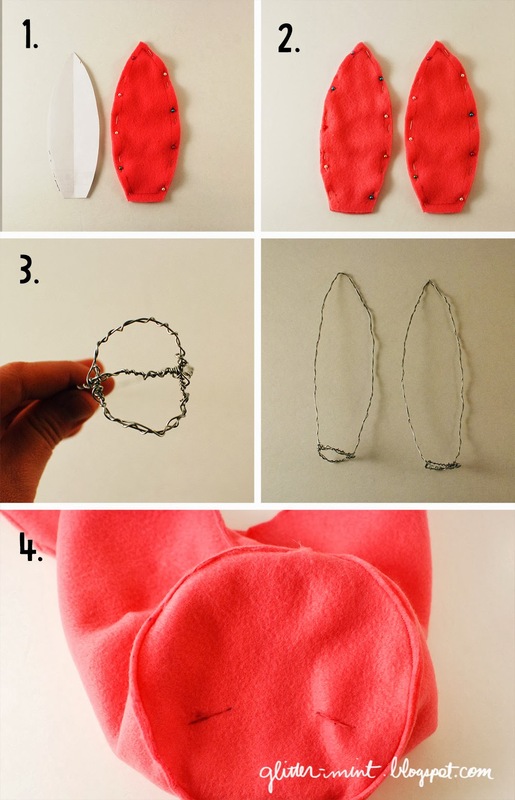 Print the ear template and cut ears from the pink fleece. 2. Pair up the fleece, pin together, and sew. Flip right side out. 3. Bend wire into the ear shape (double up the wire for extra sturdiness). Attach a wire circle as a base by wrapping it to the ears. 4. Mark where you want your ears and stitch them the same way as the Finn hat. We placed the ears a little closer to the front and angled. We even made a menu for craft themed foods like on the show. Do you have the pattern for the bunny ears? I just put the bunny ear pattern up! So so so sorry it took me a million years! Where can I find the bunny ears template? Hey! 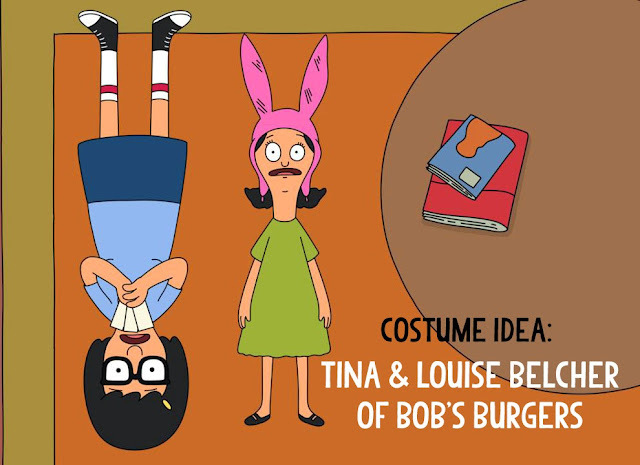 Great job on the Louise hat. I've printed off the template and am really surprised at how large it looks. Did you adjust any of the measurements when you made your hat? This is awesome! I'm going as Louise for Halloween. What kind of size adjustments did you do the your Louise hat from the Finn template? To me it looks like the side flaps look slightly longer than Finn's. Thanks! So the hat from the Finn template is actually kind of large. I made the hat following the instructions and then shortened the forehead portion and back/neck portion. I think that's why the earflaps look longer. Sorry if that explanation is confusing :/ I don't really know how to make hats (hence the instructables pattern haha) so I just kind of eye-balled it until it fit Monica's head. Hope this helps a little! And I hope your costume comes out awesome! Wearing that Louis hat is so fun! Thank you! I just used some floral wire that I got at Michaels. Most craft stores (Michaels, Joanns, Hobby Lobby, etc) should have wire. Hardware and gardening stores should have wire too. Hi! This is amazing! I noticed there is a seam in the front of the Louise hat and not on the Fins hat. Is there something different I should be doing? Or am I making this hat completely backwards? Uh oh! 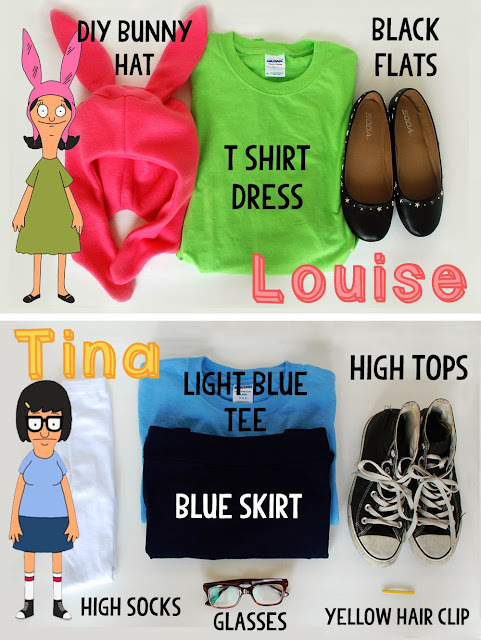 What size tshirt did you use for the Louise costume? How much fleece did you use? 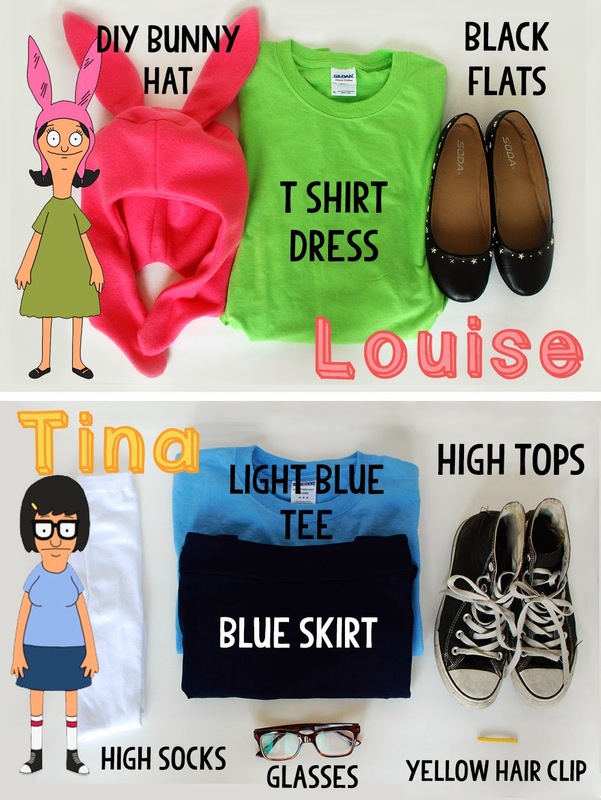 Could you elaborate more on how you made the t shirt dress? Please and thanks! Love this btw.